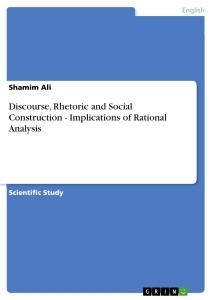 Discourse Analysis, the study of stretches of text in context, has been implemented within a wide variety of theoretical and empirical frameworks, concerning a broad range of linguistic and socio-linguistic phenomena. In Modern Hebrew the investigation covers, among other sub-fields, areas as diverse as genre analysis and stylistics, conversation analysis, coherence and cohesion, discourse markers, issues in translation, acquisition of discourse skills, speech acts, the interfaces between text and sentential structure and, less prototypically, but very interestingly, computational parameters. Discourse analysis is a way of understanding social interactions. The researcher acknowledges their own bias and position on the issue, known as reflexivity. The aims of research vary: The aim of one investigator might be to understand power relationships in society in order to bring about change; another may be interested in appearance and how it can shape identify; and another investigator may be interested in an interaction or conversation simply for its own sake (in terms of not knowing what the study might uncover). The research begins with a research question (and not a hypothesis in the formal sense) that is aimed at a theoretical position. A conversation or piece of text is transcribed and then deconstructed. This involves attempting to identify features in the text, such as discourses. A discourse is a particular theme in the text, especially those that relate to identities, for example such as a statement that reiterates a view or claim that now children find traditional weddings dull, and so on. Topics that have been studied include interviews, meetings , family conversations of family, speeches of the leader of the world, media discussion on politics, gender difference in discourse, motherhood, and so on. As it is a subfield of linguistics and it is appropriate to say that discourse analysis goes beyond linguistics. Discourse analysis is a wonderfully creative enterprise. It is also a disciplined enterprise. Discourse analysis promotes a view of languages which says that language use is not only reflective of other aspects of our lives but is also constitutive of anthro pological oriented schools of linguistics. Finally I must say that discourse analysis brings to linguistics and related disciplines a human dimension. It focuses on language as it is used by real people with real intentions, emotions and purposes. The emergence of this study is a result of not only linguistic research, but also of researchers engaged in other fields of inquiry, particularly sociology, psychology, anthropology and psychotherapy (Trappes-Lomax 2004). In 1960s and 1970s other scholars, that is philosophers of language or those dealing with pragmatics enormously influenced the development of this study as well. Among other contributors to this field the Prague School of Linguists, whose focusing on organization of information in communicative products indicated the connection of grammar and discourse, along with text grammarians are worth mentioning (McCarthy 1991). A significant contribution to the evolution of discourse analysis has been made by British and American scholars. In Britain the examination of discourse turned towards the study of the social functions of language. Research conveyed at the University of Birmingham fruited in creating a thorough account of communication in various situations such as debates, interviews, doctor-patient relations, paying close attention to the intonation of people participating in talks as well as manners particular to circumstances. Analysis of the factors essential for succession of decently made communication products on the grounds of structural-linguistic criteria was another concern of British scholars. Americans, on the other hand, focused on examining small communities of people and their discourse in genuine circumstances. Apart from that, they concentrated on conversation analysis inspecting narratives in addition to talks and the behavior of speakers as well as patterns repeating in given situations. Division and specification of types of discourse along with social limitations of politeness and thorough description of face saving acts in speech is also American scholars' contribution (McCarthy 1991).The range of inquiry of discourse analysis not only covers linguistic issues, but is also concerned with other matters, such as: enabling computers to comprehend and produce intelligible texts, thus contributing to progress in the study of Artificial Intelligence. Out of these investigations a very important concept of schemata emerged. It might be defined as prior knowledge of typical situations which enables people to understand the underlying meaning of words in a given text. This mental framework is thought to be shared by a language community and to be activated by key words or context in order for people to understand the message. To implement schemata to a computer, however, is yet impossible (Cook 1990). Discourse analysts carefully scrutinize universal circumstances of the occurrence of communicative products, particularly within state institutions. Numerous attempts to minimize misunderstandings between bureaucrats and citizens were made, resulting in user-friendly design of documents. The world of politics and features of its peculiar communicative products are also of concern to discourse analysts. Having carefully investigated that area of human activity scholars depicted it as characterized by frequent occurrence of face saving acts and euphemisms. One other sphere of life of particular interest to applied linguists is the judicature and its language which is incomprehensible to most common citizens, especially due to pages-long sentences, as well as peculiar terminology. Moreover, educational institutions, classroom language and the language that ought to be taught to enable learners to successfully comprehend both oral and written texts, as well as participate in real life conversations and produce native-like communicative products is the domain of discourse analysis. Last but not least, influence of gender on language production and perception is also examined (Renkema 2004, Trappes-Lomax 2004). The examination of oral discourse is mainly the domain of linguists gathered at the University of Birmingham, who at first concentrated on the language used during teacher - learner communication, afterwards altering their sphere of interest to more general issues. However, patterns of producing speech characteristic of communities, or members of various social classes within one population were also of ethnomethodologists' interest. A result of such inquiries was discovering how turn taking differs from culture to culture as well as how standards of politeness vary. In addition, manners of beginning discussions on new topics were described (McCarthy 1991).What is more, it was said that certain characteristics are common to all societies, for instance, indicating the end of thought or end of utterance. The words that are to point the beginning or the closing stages of a phrase are called 'frames'. McCarthy (199) claims that it is thanks to them that people know when they can take their turn to speak in a conversation. However, in spite of the fact that frames can be noticed in every society, their use might differ, which is why knowledge of patterns of their usage may be essential for conducting a fluent and natural dialogue with a native speaker. Moreover, these differences are not only characteristic of cultures, but also of circumstances in which the conversation occurs, and are also dependent on the rights (or 'rank') of the participants (McCarthy 1991).